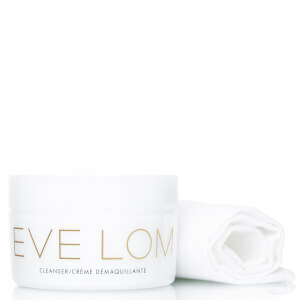 The Eve Lom Cleanser was described by Vogue as "probably the best cleanser in the world" and is the foundation of the Eve Lom skincare regimen. With the cleanser's signature blend of four aromatic plant oils, specially woven 100% cotton Muslin Cloth and quick routine, the result is incredibly glowing, radiant skin with a smoother, more refined texture. The difference can be seen instantly and just keeps on improving with use. Deep cleans without drying or stripping the skin. Removes even the most stubborn waterproof makeup. Exfoliates, tones and improves circulation. ​Please note: When subject to temperature change, the formula has a tendency to crystallise over time. This is a natural process and varies per product. Warm up the cleanser between hands to melt the crystals before applying. 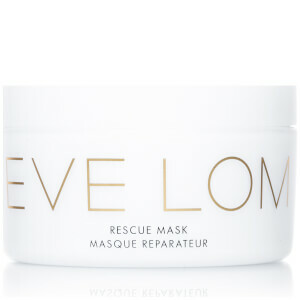 The exfoliation benefit is generated by using the woven muslin cloth provided. The color of the product may vary from yellow to green, dependent on the harvest of the Chamomile Oil. This does not impact the efficacy of the product. Use once a day, at night for normal/dry skin types. Use twice a day, morning and night for congested skins. Massage a small amount onto the face and neck onto dry skin over the grime and makeup from the day. Fill the basin with hot water and immerse the Muslin Cloth. Squeeze off excess water and hold the cloth over the face and neck for a few seconds while taking a deep breath. The heat will soften the skin and open the pores allowing the aromatic oils to cleanse the skin of impurities. For optimum results repeat this stage three times. Fold the hot, rinsed cloth into a square and work it in small circular movements across the face and neck to remove all traces of Cleanser and makeup. Finally rinse the cloth in cool water and hold over the face and neck. Paraffinum Liquidum (Mineral Oil), Peg-30 Lanolin, Cetearyl Alcohol, Bis-Diglyceryl Polyacyladipate-2, Aluminum Stearate, Theobroma Cacao (Cocoa) Seed Butter, Peg-75 Lanolin, Chamomilla Recutita (Matricaria) Flower Oil, Eugenia Caryophyllus (Clove) Leaf Oil, Eucalyptus Globulus Leaf Oil, Humulus Lupulus (Hops) Cone Oil, Phenoxyethanol, Methylparaben, Bht, Butylparaben, Ethylparaben, Propylparaben, Isobutylparaben.